For very rare stamps, like Moldavia Bulls Heads, inventories exist listing and illustrating each known stamp and cover, its provenance and so on. Fritz Heimbüchler's work on the Bulls Heads is a very, very good example. But once stamps become a bit more common, we actually have no idea how many (now) exist. How many Russia #1 exist? How many Russia # 1 on cover? It's a pity that America's NSA and Britain's GCHQ don't interest themselves in this kind of question - I am sure the Technology exists to spy into albums and stockbooks and add up the results. It would be much more interesting than the contents of people's emails. So we have to guess. Hands up if you think that less than 500 covers exist with Russia #1. Hands up if you think less than 1 000. More than 5 000? And so on. Nowadays, philatelists can be snobbish about mere collectors who want "one of each stamp" but I think it can be very interesting if combined with "one of each stamp, as a single franking, at the correct period, paying a recognisable tariff, on cover". Interesting and very hard. If you were doing it for Imperial Russian stamps during the Tsarist period (so forget about imperforate stamps issued under the Provisional Government and later), you would be well advised to ignore rouble values - unless you were willing to include Money Transfers and Parcel cards. You would also struggle with frankings comprising a single 70 kopeck stamp and even 50 kopecks would be hard. That's not all. Even though some stamps are so common used that they really have no value, finding them on cover can be incredibly difficult. Look at the 1888 item above. It's a single sheet of printed matter, folded for despatch into letter shape, and sent from St Petersburg to Ekenas, Finland. 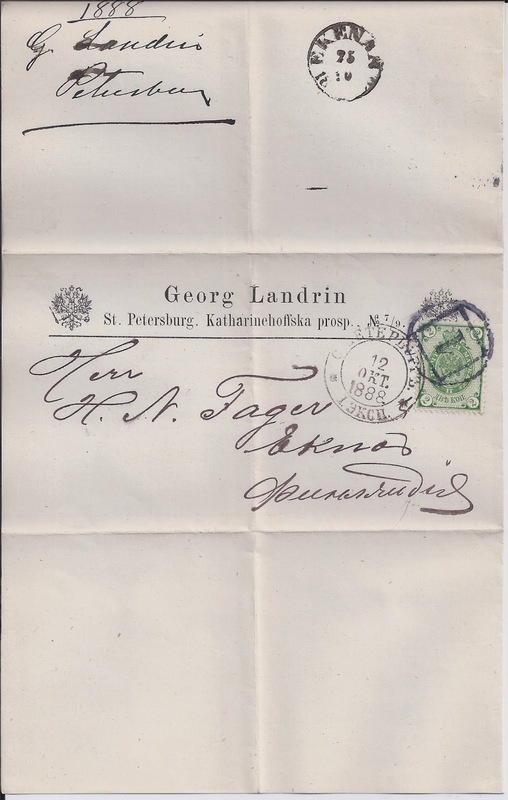 It qualified for a concessionary Printed Matter Tariff of 2 kopecks and the franking is provided by a 2 kopeck stamp in yellow green without thunderbolts. 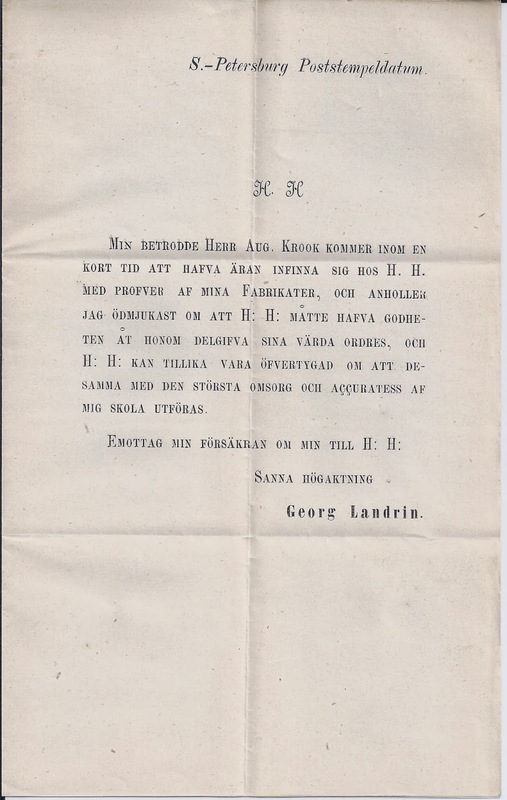 From a dealer's box you might expect to pay 15 euros - maximum 25 - because it is clean and pretty and announces (in Swedish) a forthcoming visit from a travelling salesman carrying samples of Härra Landrin's products. But find me another one. The NSA and GCHQ would have to do a lot of Bulk data collection to find even a few hundred of such items - that's my guess. Or to make a more precise guess, I guess that fewer examples exist of this stamp on cover than say Russia # 2. Of course, you can prove me wrong - just send me the scans and I will add them to the Blog!